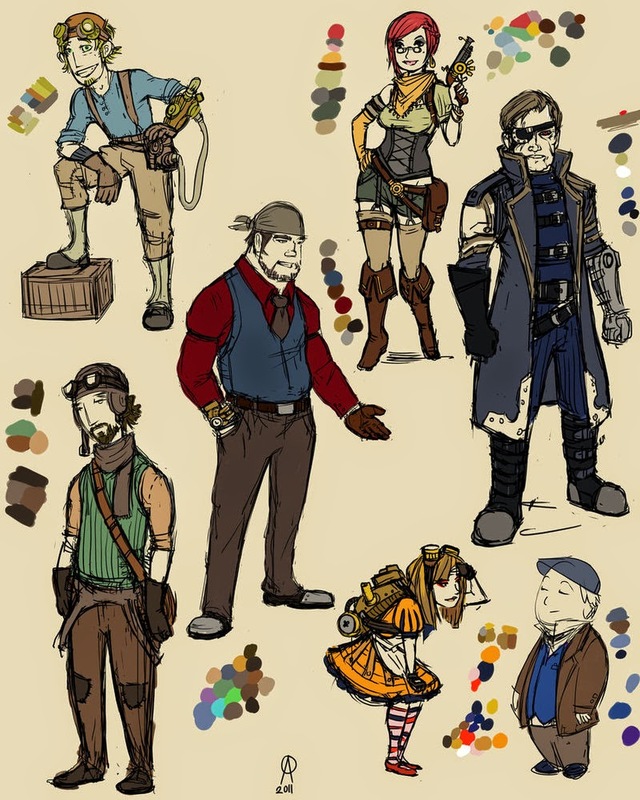 This week‘s post was about my Steampunk Australia campaign and the reasons it failed. The characters were NOT one of those reasons, however – the characters were great, thanks to an imaginative group of players. For another Thursday post, here they are, presented in terms of personalities and trademark abilities in case you want to adapt them to your game, show them to a player who’s lacking basic inspiration, etc. Picture by azimuth-oakes on deviant art. Description: Clueless, naïve, bumbling young gentleman adventurer. Tends to get in and out of danger without quite grasping the seriousness of the situation, takes even the strangest things in stride as if they are quite normal. Future grandfather of JRR Tolkien; the stories of his travels are what inspires the young writer. Party role: The organizer of the expedition and nominal leader, but he mostly gets them into scrapes that require the skills of the other party members to get out of alive. Trademark abilities: Stumbles onto the right course quite by accident (good ability for finding secret passages, being in the right place to overhear conversations, etc.). Can make tea out of anything. Description: Half British, half Japanese conman. Was in the act of burglarizing the Tolkien home some time ago when Periweather mistook him for a butler, and has served as Perry’s valet ever since; Perry’s adventures and cluelessness provide Carn with many ripe opportunities for theft. Party role: Adept at thievery, cons, and perceiving when the party is being conned. Description: Crusty old veteran with bulldog companion. Mechanical left arm which mounts hook, shotgun, or machete attachments. Has visited most corners of the British empire. A disproportionate amount of his luggage space is devoted to liquor. Party role: Perry hired Clapstone for his experience and his weapons prowess. He fills the dual roles of tank and strategist. Trademark abilities: Strategy. Predicting enemy movements. Tall tales. Setting up elaborate pranks intended to scare people. Description: Sleek, lanky gentleman with a finely groomed mustache and TONS of weapons and gadgets. What Clapstone has in experience and brute force, Van Valen has in intuition and finesse. Works as a “pest control” professional for expeditions or new colonies – rooting out the big (and little) game that threatens humans. Party role: Gadget man. Guide. Insight into the Outback, the beasts that live there, and the strange souls who have been marked by it. Trademark abilities: Instinctive hunter/tracker. A walking bestiary – knows most of the creatures in Australia. Can quickly discern the behaviors and weaknesses of those that are new to him. Description: Covered head to foot in black, bandage-like material, as if recovering from some horrible illness or injury. After the party found her stowed away on their vessel, she proved so useful as a healer (and a killer), so she’s been allowed to travel with them – no questions asked. Party role: Vanishes into the shadows whenever the trouble starts, so she can keep an eye on the situation and intervene if necessary. Trademark abilities: Has an almost supernatural knack for herbs; understands plants and their nature instinctively. When a potion is needed, she can roll to either have it on hand or quickly create one. Her mysterious connection with nature is matched by an equally mysterious cult of which she’s a member, and which seems to keep a silent watch over her. Description: Aborigine in a top hat and loincloth. Speaks no English (the player would speak his actions, but had to find alternate ways to communicate with the other PCs).